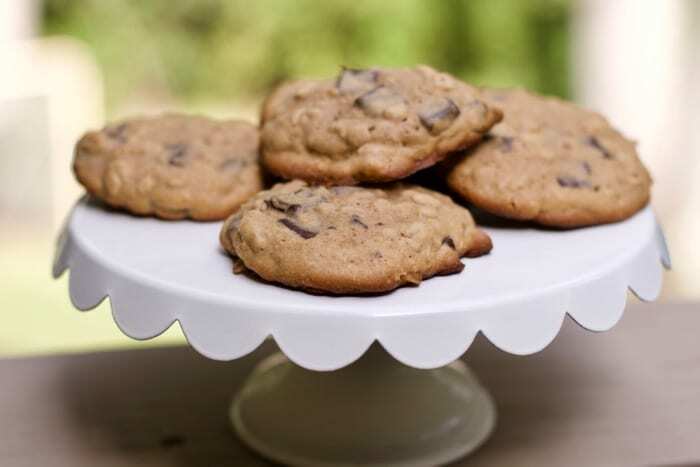 Does your family ever have trouble agreeing on what type of cookie to bake for dessert? Well this cookie recipe might be just the answer to your problem. 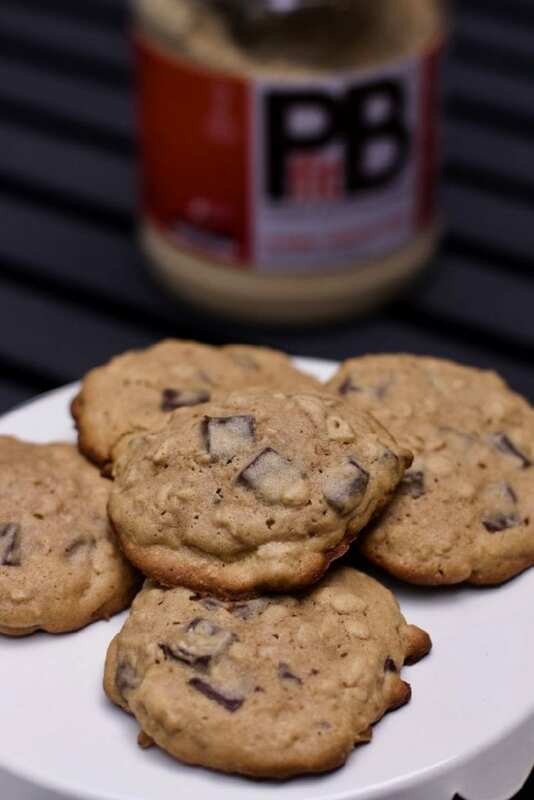 Plus we are making these Peanut Butter Oatmeal Chocolate Chip Cookies: Baking with Peanut Butter Powder. Thanks to PBfit for sending over samples to experiment with. 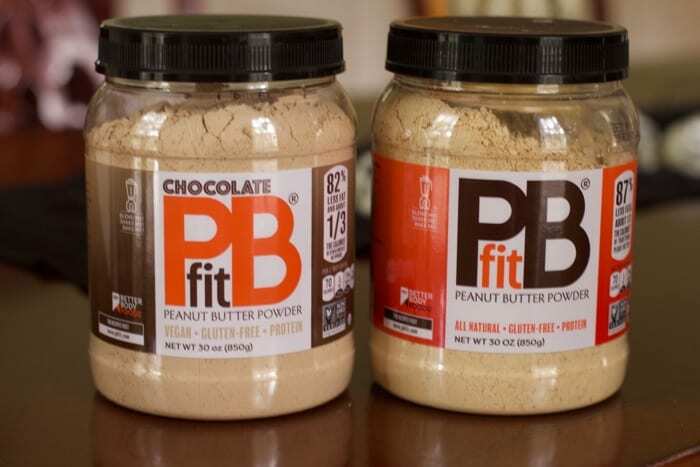 Feel good about the peanut butter that you are feeding your family by making the switch to PBfit. 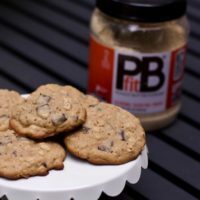 With 87% less fat than traditional peanut butter and 1/3 the calories, all natural PBfit will make this traditional combination healthier and even more delicious than ever. 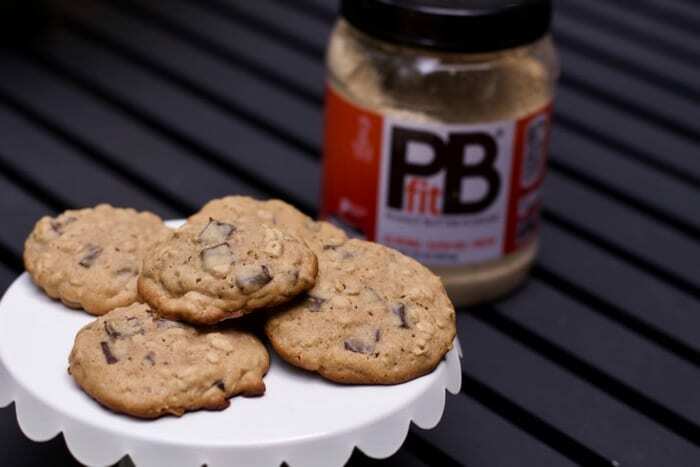 We have already added PBfit to oatmeal, Banana Muffins and smoothies. So we decided to try adding it add them to homemade cookies. You are sure to make every cookie lover in your family happy. It has everything they would want. 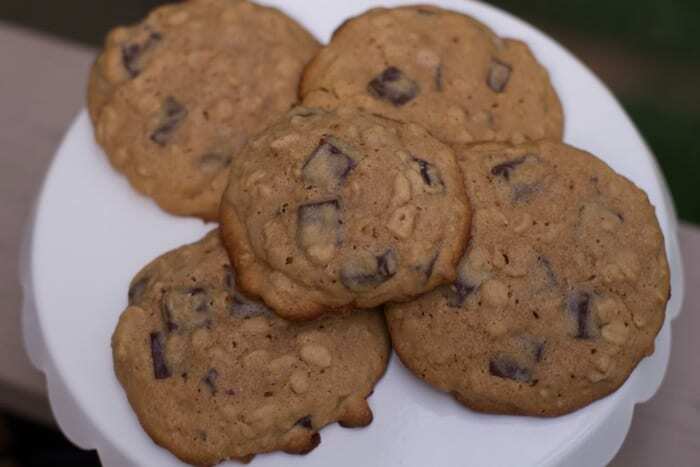 Peanut Butter, Oatmeal and Chocolate chips all rolled into one cookie. By using PBfit we lower the fat content as well making these almost like a breakfast cookie! They smell amazing in the oven and while they are cooling. I had to snag a taste while they were on the cooling rack without getting caught. I used a large ice cream scoop so this recipe only made 14 good sized cookies. Despite the size they were also done in only 10 minutes. Because they were a little thick they stayed nice and moist inside. I am glad I pressed down the balls slightly before putting them in the oven as they did not spread that much. My kids especially loved these and did not have any trouble dipping them in some milk after dinner. My middle son’s impressions were I was not sure if this was a peanut butter or oatmeal cookie when I saw them on the counter. Well he got it all. After I baked these I noticed my centerpiece of M&M’s left over my son’s party and wish I added them for a festive cookie. We are definitely making these gems again. I might even have to double the recipe next time and freeze some of the dough balls. *****You will need to constitute the PBfit and the water to make 1/2 cup of peanut butter. Using the directions on the label. The amounts of water to powder varies. MIX first 5 ingredients until well blended Beat butter, sugars and peanut butter in large bowl with mixer until light and fluffy. Add egg and vanilla; mix well. Gradually add flour mixture, mixing well after each addition. Stir in chocolate. Have you ever baked or used Peanut Butter Powder? If so what is you favorite way to use it?